For most people, traveling the world is a dream for a distant retirement attained after years of financial self-sacrifice and moderation. It just is not feasible for the majority of people to whisk themselves away to foreign lands on a whim regardless of their passion for travel and foreign culture. One option, however, is to take the plunge and take on employment in another country. Aside from the practical and bureaucratic matters that must first be attended to (visas, work permits, or citizenship applications), there is some sincere soul-searching and goal setting to be done. There are always risks involved and one person’s life-affirming adventure could be another’s nightmare on earth. 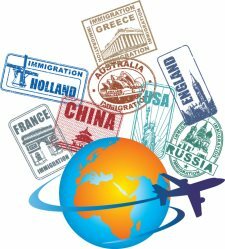 So as you consider overseas (or even other North American countries) employment, keep your passions in check and consider the following tips for working in a foreign land. 1. Never forget that the world can be a very dangerous place. Unfortunately, for Americans, political and cultural factors can lead to potentially volatile situations should your nationality be discovered; especially in certain parts of the world. The U.S. Department of State regularly updates a list of “danger zones” designating global hotspots for general violence and nationality-specific violence. Before making a decision to move, know the risks and make an informed choice. 2. Companies in other parts of the world don’t always operate as U.S. companies do; even companies headquartered in the U.S. Business etiquette and practices are dictated by local cultural influences and traditions. As such, you should have a clear career path before accepting an overseas job so that you can ensure that you will be able to build the right kind of skills and collect the right kind of experiences to propel your chosen career forward. 3. Working in another country is also not simply a matter of picking up your life and transplanting it somewhere else. Instead, there is a web of requirements determined by each country that you must follow before permission to work can be granted. Typically, a foreign company must prove that an offered position cannot be filled by a native worker and also bear the responsibility of offering you a work visa. In short, know the relevant laws for the country where you wish to work. 4. An obvious, but frequently dismissed, piece of advice is to actively use the foreign language you will need for high-level communication in your chosen country. The more fluent you are in the native tongue the more help your language skills can provide for your career. 5. Finally, making the decision to work in another country is only the first step in the process; and the process isn’t short. In order to move through the process efficiently and in the shortest amount of time, you will need to know the deadlines for the numerous applications you must submit for required documentation. This is a months-long process, perhaps even up to a year, so the quicker you commit to the course and start the application process, the more likely you are to be accepted.